Werner Sander was born on 5 August 1902 in Breslau, he came from a Jewish family. In the synagogue choir, he received his first musical training, he later studied at the Conservatory. His work as a private music teacher and conductor of several choirs ended in 1933 with the prohibition of labour by the National Socialist regime. As head of the choir of the Breslau Jewish Cultural Association and teacher in Jewish schools he continued his musical work. After the banning of Jewish education, Sander was deported to forced labour camps for Jews in Kurzbach and Grünthal, satellite camps of Groß-Rosen concentration camp in 1943. His parents were murdered in Theresienstadt and Auschwitz. In November 1945, Sander came to Thuringia. In Meiningen, he worked as a music teacher in school and as leader of the Meininger Chorgemeinschaft. In 1950 he was appointed cantor at the Jewish Community in Leipzig, where he directed the synagogue choir and contributed to the mediation of religious traditions. For community members who lacked knowledge of the Hebrew language, he published the prayers of the Israelites for Sabbath and festive days in phonetic text and German translation. Starting in 1954, Sander worked in Dresden as a cantor. In 1962 he was appointed chief cantor. 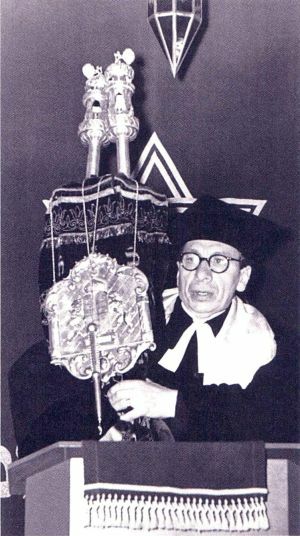 From a chamber ensemble of the Leipziger Oratorienchor which he founded in 1951 emerged the Leipziger Synagogalchor in 1962, Sander presided as conductor. Now, he devoted himself to the performance of traditional synagogal music which had to be introduced to a larger audience outside of the Jewish communities. To expand the choir’s repertoire, new arrangements were created from 1964 for Yiddish and Hebrew folk songs, including Schiron, a cycle of love songs from the Song of Songs according to folk melodies. Werner Sander died on 21 July 1972. His last concert with the Leipziger Synagogalchor he conducted six weeks before in the Apollo Hall of the German State Opera in Berlin.